This time of year, many of us gardeners are almost literally rolling in vegetables. Tomatoes, peppers, squash, melons, okra, beans – the harvest is in full swing! If you have a good-sized garden, the bounty can sometimes seem overwhelming. 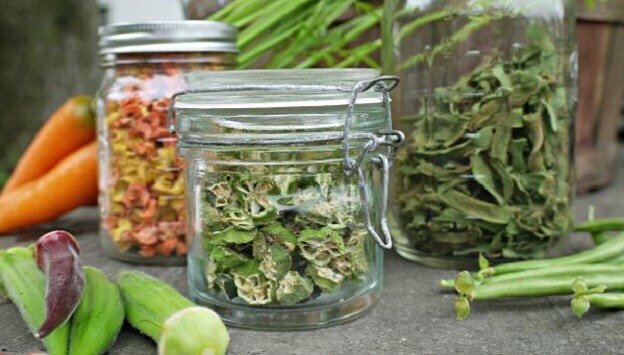 Preserving some of your harvest for future use is a necessity if you want to keep all that fresh produce from going to waste! Canning, freezing, pickling, and drying or dehydrating are a few of the most common ways to preserve your harvest for the colder months. Some of these methods require more effort than others, and most gardeners will choose a variety of methods to suit their particular needs. One preservation method that doesn’t always get as much press as canning or freezing is dehydration. Electric dehydrators are readily available and affordable, but some gardeners choose to build and use a solar dehydrator instead, or you can also dry produce using your oven. Whichever method you choose, this can be a great way to save some of that gardening goodness that’s currently coming your way, and enjoy it during the months when your garden isn’t doing much! There’s so much to love about dehydrating vegetables. Once dehydrated, they take very little room to store. Nutrients aren’t destroyed as they are with canning. If the electricity goes out for an extended time, nothing is spoiled. And dehydrated veggies can store for years. Most vegetables can be dehydrated; some require blanching first, but for many vegetables, prep is as simple as chopping or slicing…. There are many ways to dehydrate including sun drying, oven drying, or using an electric dehydrator…. Label your containers with the item and date….